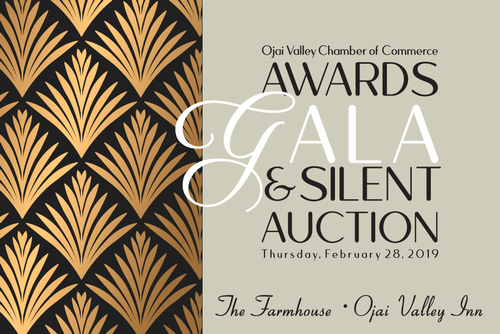 The Ojai Valley Chamber of Commerce's Annual Celebrating Business in the Ojai Valley Gala Awards Dinner is held each year on the fourth Thursday in February to honor Chamber members in six categories for being the best at what they do. This is our first fund raising event of the year and sponsorships are available at three levels: Platinum ($1,500) Gold ($1,000) and Silver ($500) To purchase tickets or to be a Sponsor, click on the Register Online link above. There will be a cocktail hour prior to our newly formatted delectable food tour. Single event tickets also available through "Register Now" link above. Once again the Chamber's Gala is hosted by the luxurious Ojai Valley Inn, a Five Diamond Resort. Awards Program begins at 8:00 p.m. Event tickets are $99 each if purchased by February 6th, 2019 and $120 when purchased after February 7th. Big Ticket Raffle tickets are $50 each or Five for $200.